Alternating current can shake a wire like a guitar string. The audio signal in a stereo system is seen as alternating current. The audio signal, be it digital or analog, through tube or solid state, is always alternating current. The signal's cyclic effect, causes all the wire in the system to vibrate and ring. This ring becomes a song sung to the resonance of the electrical and mechanical components of the cable. Every interconnect, every speaker cable, every chassis and speaker wire has its own song. The stored mechanical and electrical tension and time delay characteristics of the cable determine what song is sung. Each and every strand in a cable has its own note or beat. Two or more wires of the same mass and tension have common mechanical resonating points and share the same note. Two or more wires or bundles of wires, differing in size, each have their own resonant points. When combined, wires find new points of interaction, creating yet another note. The sound produced by any stereo system depends on the purity of the audio signal. When the cable that links all the components together imparts its own sound the audio signal is corrupted. There is a unique way to eliminate the harmonic or resonant effect produced by the conductor itself. Create a multiple strand conductor, where the individual strands share no common mathematical node or resonant point and layer them to cancel the noise they each create. An infinitely indivisible progression known as the Fibonacci sequence or Golden Section is the key to resonance control. The ratio of Phi, or 1 to 1.6180339887...to infinity, is the Golden Mean, called Golden Ratio or Golden Proportion. In Golden Section Stranding, strands are arranged so that every strand is coupled to another, whose note is irrational with its own, to dissipate conductor resonance. This creates a silenced conductor, allowing Cardas cable to produce the purest possible audio signal. No other cable geometry, no other conductor design, can create the listening magic of Golden Section Stranding. The root or power plant of conductor oscillation is stored and reflected energy. The progressively layered constant Q conductors effectively attenuate this energy. 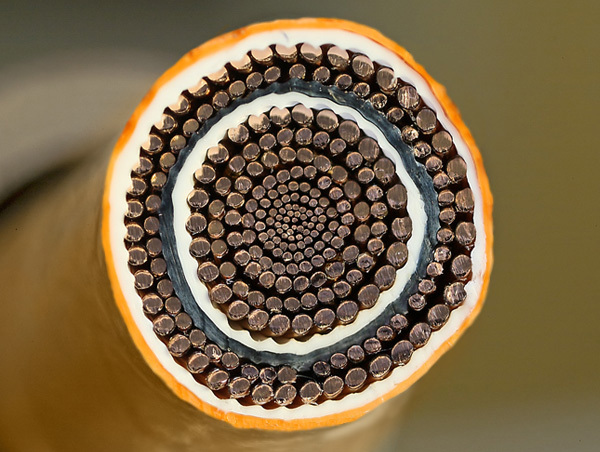 Cardas cables employ a unique stranding method where the smaller strands are placed towards the interior of the conductor in Golden Proportion. This is called constant "Q" stranding. It is a very effective method for reducing the inductively stored and reflected energy that fuels cable resonance. Cardas uses pure copper, Litz wire, pure PFA and air dielectrics, ultra pure eutectic solders, custom made rhodium plated connectors and each cable is terminated by hand. It is this meticulous attention to the details of design and care in construction that have made Cardas the heart of the most uniquely musical systems in the world.